Medicine compounding can be an important part of wound care. IPS Compounding pharmacists understand that. Our pharmacists are different. They pay attention to your needs. Prescriptions are specifically formulated to help wounds heal both efficiently and effectively. 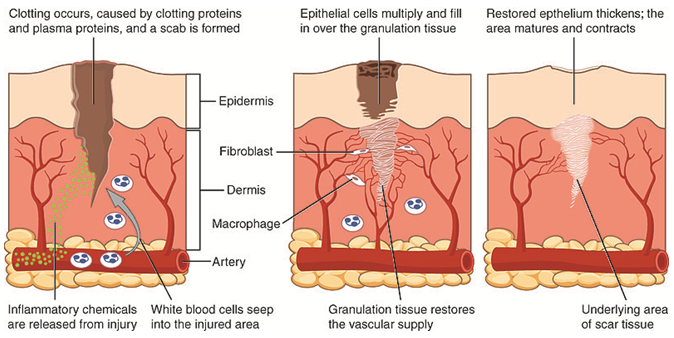 Understanding the process of wound healing yields compounding insight. Each stage has a specific purpose, and there is an order to the process. Following are the four stages, with some end commentary on how compounded medicine helps. At the onset of injury, this stage begins. The purpose is to stop the wound from bleeding. Therefore, your body activates its blood clotting (or emergency repair) system. Essentially what happens is your body forms a dam to keep the wound from bleeding, seeping or draining. Your blood cells deliver platelets to the wound site. Once there, they come into contact with collagen. This results in activation and aggregation. Thrombin (an enzyme at the center of the process) begins to form a fibrin mesh, which in turn clumps the platelets together to form a clot. The end game for phase one is coagulation. So stage one is all about clotting. Stage two focuses on destroying bacteria as well as debris removal. Once the blood coagulates, new white blood cells (neutrophils) are carried to the wound site. If Phase 1 is primarily about coagulation, the second phase, called the Defensive/Inflammatory Phase, focuses on destroying bacteria and removing debris. These white blood cells will increase for 24-48 hours, then all but disappear within three days or so. As neutrophils leave, specialized cells (macrophages) arrive to continue the debris clearing process. In doing so, they secrete proteins and factors which specifically attract immune cells to foster tissue repair. Typically, this stage will last between 4-6 days. It tends to be painful too, as edema, erythema (reddening), pain and heat are part of the process. Yet, the ultimate purpose it to prepare the site for new tissue growth. Incidentally, this stage of wound care has three phases itself. First, the wound bed is filled with shiny, red granulation connective tissue and new bloods vessels form. Second, the margins of the wound contract and begin to pull toward the wound center. Finally, epithelial cells rise up from the wound bed and begin covering the wound with new epithelial cells in leap frog fashion. The proliferative phase can last anywhere from 4-24 days. The sole purpose is to fill and cover the wound. During this phase, your new tissue gains strength and flexibility. This is where collagen fibers come into play again. They reorganize, as the new tissue remodels/matures, and tensile strength improves (limited to 80% of tissue strength pre-injury). Maturity varies greatly from wound to wound. As such, it can last anywhere from 21 days to 2 years. So what do we understand now? The healing process for wounds is astounding and complex. Yet, it can also be interrupted. Local or systemic factors like infection, nutrition, age, moisture and body type can hinder the process. Yet, when a proper healing environment is in place, the body can work wonders. IPS Compounding works to produce compounded medicine that will create a proper space for your body to heal. In addition, you may want to review our wound care tips. They offer further information on caring for wounds and offer best practices. If you still have questions about your topical cream or ointment, get in touch with us. By partnering with your doctor, we may be able to prescribe a compounded medicine to aid with your recovery. WELCOME to the IPS Compounding Blog! Our blog is a great place to learn more about who we are and what we do, so check back regularly to keep up with all that's going on at IPS Compounding.